Individual Identification of Japanese Macaques by Coo-calls: Pitch or Vocal Tract Characteristics? Japanese monkeys inhabit in the forest, where voice appears to be very important for them to communicate with their family because they can hear their family but cannot see their family in the forest through trees. They often use vowel-like vocal sounds, called "coo-calls," for their vocal communication. Then, they have to know whom they are talking to without seeing each other. This study investigates how Japanese monkeys identify the caller, who uttered a coo-call, only through the voice of the caller. Two adult male Japanese monkeys participated in this study. They were trained to discriminate coo-calls uttered by Monkey A from those of Monkey B, where Monkey B calls served as Go while Monkey A calls served as Go-Nogo stimuli. Neither of them, Monkey A nor Monkey B, was familiar to the monkeys that participated in the experiments. Coo-calls, which were never used for trainings, were used for testing stimuli. Morphed coo-calls between Monkey A's and Monkey B's coo-calls, where either pitch or vocal tract characteristics was varied, were also adopted for test stimuli. In the first experiment (Exp 1) pitch, the fundamental frequencies (f0) of coo-calls produced by Monkey A and Monkey B were different. (Fig. 1). The vocal tract characteristics are frequency weights created between vocal folds and mouth which are shown in an uttered voice. The participants could nicely discriminate coo-calls of Monkey A from those of Monkey B. Results indicated that both pitch and vocal tract characteristics were important for Japanese monkeys to identify who the talker was. Now in the second experiment (Exp 2), the averaged pitches of Monkey A and Monkey B were made to be the same but temporal pitch patterns were different (Fig. 2). The results from Exp 2 show that the monkeys used the vocal tract information to identify the caller but not the temporal pitch patterns which they could use for identification of the caller (Fig. 3). The results were consistent for two participants (Figs. 3 and 4). The present results that Japanese monkeys depend on the vocal tract characteristics to identify the caller were similar to humans to identify the speaker. Fig. #1: Temporal pitch patterns (F0, Left) and vocal tract characteristics (frequency weighting) of coo-calls used in Exp 1. (VT, Right). Both F0 and VT of Monkey A (Blue) and Monkey B (Red) were different. Fig. #2: Acoustical characteristics of coo calls for Monkeys A and B used in Exp. 2. Temporal pitch patterns (F0, Left) and vocal tract characteristics (VT, Right) of coo calls of Monkeys A (Blue) and B (Red). Error bar: standard deviation. Averaged F0s of Monkeys A and B were the same but temporal patterns were different. Fig. #3: Responses to test stimuli of two participant monkeys. (Left) Go response rates to test stimuli for subjects (Black circle: Subject 1, White circle: Subject 2). Go response rates to F0NoG-VTGo for each monkey subject were higher than Go response rates to F0Go-VTNoG. (Right) Reaction times (RTs) to test stimuli (Purple bar: RT to F0NoG-VTGo, Green bar: RT to F0Go-VTNoG). 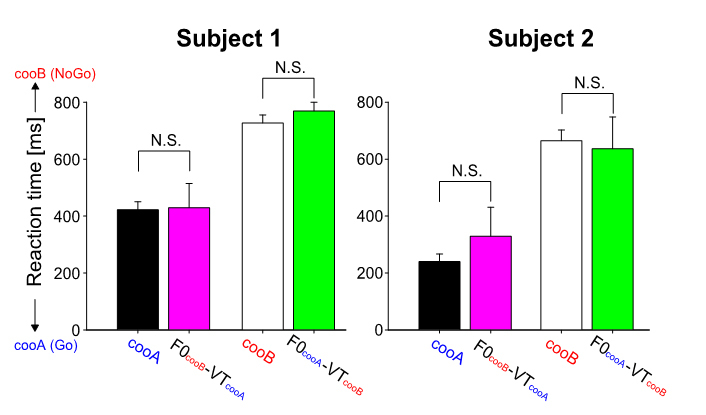 If the subjects did not release the lever within 800 ms response period, we recorded RT as 800 ms. RTs to F0NoG-VTGo significantly shorter than RTs to F0Go-VTNoG (*** p = 0.001). Fig. #4: Responses to training stimuli and test stimuli of two participant monkeys (Subjects 1 and 2). Comparisons between reaction times (RTs) for training and chimera stimuli for testing for two monkeys. No significant difference between RT for Go stimulus (black bar) and RT for F0NoGo-VTGo (purple bar) was observed, while RT for NoGo stimulus (white bar) and RT for F0Go-VTNoG (green bar) was not different, either.